The Samba originated in Brazil and what better time to go and learn it than during the Carnival in Rio de Janeiro? This annual event is held for 4 days, 40 days before Easter. Stay at one of the Rio hotels or Rio resorts right in the heart of the Carnival area and afterwards you will be able to go home and wow your family and friends with your newfound dancing talent. In addition to the Carnival, there are many famous sites and sounds such as Christ Redeemer, Tijuca Forest, Sugarloaf and miles and miles of beautiful beaches. Rio de Janeiro weather at the beaches is perfect and if you love the beach, be sure to visit Inpanema, Copacabana, Joatinga and if you are a surfer, Prainha Beach. There are many resorts in the area, all of which are fully staffed and very friendly. Rio de Janeiro became famous when Christ Redeemer was erected on the top of Corcovado Mountain in 1922 and recently became listed as one of the New 7 Wonders of the World. Many Rio hotels are nearby and within walking distance to this area. Rio's weather is opposite of North America and Europe and for that reason alone, the best time to visit would be during our winters. Actually anytime is the best time to visit Rio de Janeiro, as there is something for everyone to enjoy. is of Rio De Janeiro's most famous landmarks. 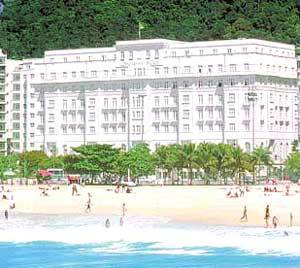 The Copacabana Palace is located on famous Copacabana Beach with spectacular ocean views and direct access to the beach. Nearby is upscale shopping and many of Rio's famous landmarks like Sugarloaf and Corcovado's Christ the Redeemer. Copacabana Palace is located 12 kilometers from Santos Dumont Airport and 32 kilometers from Rio's International airport. The Penthouse Suites are oversized suites with more than 100 square meters of space including impressive views of the beach. Each offers a large marble bathroom and large living area with balcony, beach view, and butler service. A semi-private swimming pool is located on the penthouse floor. Eash suite also offers wet bar, data port, stereo, cd player, video player, desk, fax machine, mini-bar and hair dryer. Arpoador Inn - Located in front of the gorgeous Arpoador Beach next to the Park "Girl from Ipanema", and a few steps from Copacabana and Ipanema wide variety of stores. Walking distance is Copacabana Fort , art exhibitions at Culture House Laura Alvim or the sunday attractions at the art and crafts Hiipie Fair. From the Hotel windows guests become envolved by the perfect view and from the veranda can enjoy the sunset. Atlantis Copacabana Hotel - Atlantis Copacabana Hotel is located between Copacabana and Ipanema. The two most beautiful beaches in Rio. With a strategic location, Atlantis Copacabana Hotel offers you comfort, safety and an outstanding attention you also have at your disposition tours informations in order to get the most you can of your trip. Everytime you think about Rio, think Atlantis Copacabana Hotel and stay with us, it will be a great pleasure. Best Western Sol Ipanema Hotel - The Best Western Sol Ipanema Hotel is just in front of the Ipanema Beach, in the heart of the shopping and tourist area. Whether your trip is for relaxing and indulging in the sun on the beach, enjoying the nearby art galleries, theatre or botanical gardens, the Best Western Sol Ipanema Hotel is the place to stay. Our Evidence Restaurant serves breakfast, lunch, dinner and dessert 7 days a week. We have an outdoor pool and meeting room which accommodates up to 50 guests. Our guest rooms are equipped with cable television, coffee/tea maker, hairdryer and non-smoking rooms are available. Center Hotel - Center Hotel was planned to give the best service to businessmen, who can not waste time, a very quick and efficient room service and reception, located in a privileged place in the heart of the business world of Rio de Janeiro. Restaurant a la carte and American Bar. We offer the Executive a complete Business Service while staying at the Center Hotel, including conference rooms, xerox, fax machine and other facilities. CJ-Caesar Park Ipanema - Privileged Location as Ipanema is the most elegant and the safest neighbourhood in Rio. The resorts offers personalized service with attention to guests every need. All rooms were recently renovated with exquisite taste in classic decoration. Copyright ©1999-2018 - All rights reserved.